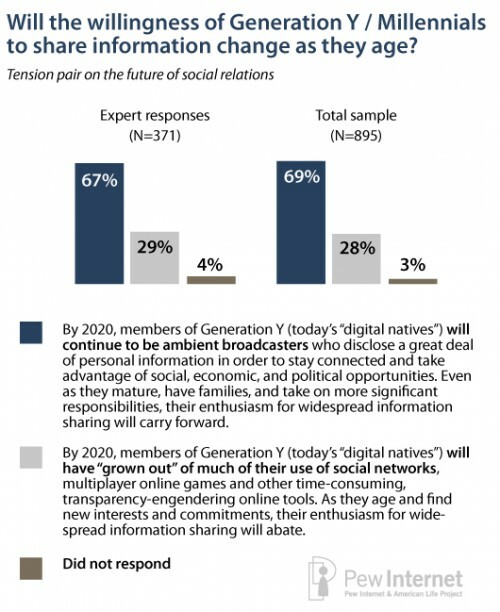 In a survey conducted by the Pew Internet and American Life Project, an overwhelming majority of technology experts and stakeholders believe that social networking and online sharing is more than just a fad for today’s youth. 1. An online chart proves that the annual birthrate REALLY began to dramatically increase in 1977, when 3.3 million babies were born compared to 3.14m in ’76 (difference = 160,000). The birthrate leveled off in ’95. 2. Those born in ’77 just came of age when the internet really started to become popular in ’95 (hence the “net generation”). A) People born in ’78 were the first to have voted 66 – 32 for Obama, as surveys prove. mid – 20s at the time.